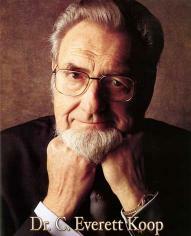 Former Surgeon General Dr. C. Everett Koop described his back and leg pain as 'incapacitating". "My pain was so severe when I lay down" said Koop, "that many nights I would go to sleep propped up with pillows leaning against a window sill". When Dr. Koop was in his forties, he was diagnosed with intractable back and leg pain. One evening at a banquet in Chicago, he complained about his pain to the person next to him. The individual pointed to a man seated at the end of the banquet table and told him there was a the doctor who could help him. Later that evening, Koop introduced himself to Gustav Hemwall, M.D. Koop told him about his condition and the pain he experienced. "I can help you" Dr. Hemwall said. After listening to Hemwall's explanation about prolotherapy, Koop underwent the treatment and has no longer been troubled with pain. Based on his personal experience, Dr. Koop became an advocate of prolotherapy. He relates that as a practicing pediatric surgeon, he would sometimes observe the back and joint pain of the parents of his young patients. One day in particular he recalls noticing a young mother having difficulty putting on her coat. He asked about her problem and she responded she had bursitis in her shoulder. He asked is she would allow him to examine her. After doing so, he told her she did not have bursitis; rather the pain was from the nerves in her neck and shoulder. He told her about prolotherapy which eventually resolved the pain in her shoulder. Koop treated scores of parents in his pediatric practice with prolotherapy, never charging them. Ligaments, cable-like structures similar in design to a rope, hold joints and bones together. Auto accidents, falls, or repetitive movements can cause ligaments to become slack or tear, much as a rope stretches, separates, or frays. Over time, the consequences may be joint damage, disk degeneration, and pain. Prolotherapy involves injections of an irritant-usually concentrated glucose-into areas where ligaments are weak or damaged. The injection must be precisely at the junction of a bone with a ligament. Dr. Koop stresses that injections that are not given at this junction could be inetteclual and even dangerous. Multiple injections are given in one sitting because one injection affects an area limited to 5mm (3/16 in) in diameter. Koop says he has injected as many as twenty sites in the same sitting. The body responds to the irritant solution with inflammation, although Koop stresses this inflammation is a "sterile" inflammation and should not be confused by an infection. This "sterile" inflammation, in turn, triggers the development of healthy new ligament tissue. Usually the patient feels fine for four to eight hours after the injections because a local anesthetic is given with the irritant. Discomfort from the injections slowly disappear over the next several days. For some, a single treatment of multiple injections is adequate; for others, it is necessary to extend treatments over a period of weeks or months. Length of treatment depends on the severity of the patient's condition as well as the patient's response to the treatment. Prolotherapy is covered by many major health insurance companies. Will Prolotherapy work for you? Patients with chronic back pain who have not responded to physical therapy, medication, chiropractic manipulation, and other conservative measures may be candidates for prolotherapy. In fact, any condition involving loose or slack ligaments may be treated effectively with the therapy. Conditions that have responded to this treatment include spine instability, scoliosis, degenerated discs, sciatica, arthritis, temporomandibular joint (TMJ), and some hip, shoulder, wrist, elbow, knee, and ankle pain.